Photo credit Dave Scadden Paddlesports. People commented how exciting it was to have taken part in the inaugural race and how they hoped to see it grow in the coming years. I found the participants’ paddleboarding expertise was wide-ranging: some seemed to be experts and others, like me, had only done it a few times. Justin and Kelly Beard of Golden, who won the 18-35 and 36-59 age divisions, respectively, told me that they enjoy paddleboarding on their travels across the country. The couple said they paddleboard every few weeks and were very happy to see the sport gaining popularity, describing it as very easy to pick up and family friendly. Similarly, Marian Schwabauer of Evergreen, who won the senior division, learned to paddleboard while in Hawaii. The U.S. Environmental Protection Agency (EPA) is awarding $1.3 million to 22 organizations in 18 states to help protect and restore urban waters and to support community revitalization and other local priorities. Many urban waterways have been polluted for years by sewage, runoff from city streets, and contamination from abandoned industrial facilities. Healthy and accessible urban waters can enhance economic, educational, recreational, and social opportunities in surrounding communities. Mystic River Watershed Association, Massachusetts ($60,000) will partner with towns and cities near Boston to create a multimedia education program to increase awareness of stormwater pollution for a regional coalition of municipalities. Pioneer Valley Planning Commission, Massachusetts ($60,000) will develop a green infrastructure plan for Day Brook in Holyoke to reduce stormwater flow into the brook and resulting combined sewer overflow discharges into the Connecticut River. NY/NJ Baykeeper, New Jersey ($48,150) will expand its plastic pollution reduction project by identifying, reducing, and preventing plastic transported via stormwater from reaching the lower Passaic River watershed and Newark Bay complex. Sarah Lawrence College, New York ($60,000) will work with community scientists to investigate the severity and local sources of water pollution while increasing community engagement and stewardship in four underserved urban watersheds in the Lower Hudson River region. Anacostia Watershed Society Inc., Maryland ($50,000) will educate and train middle-school students from low-income communities in Washington, DC on the problems associated with stormwater runoff and mitigation strategies through a variety of activities. Virginia Commonwealth University, Virginia ($59,773) will develop a community greening and green infrastructure plan for its two urban campuses and the Richmond Arts District. The Conservation Fund, Georgia ($60,000) will expand community engagement in planning for two future green infrastructure projects aimed at reducing stormwater runoff located in the headwaters of Proctor Creek in Atlanta. University of Tennessee, Tennessee ($59,995) will, through a community-driven effort, collect nutrient data across the Baker Creek watershed, which will help the City of Knoxville and Tennessee Department of Environment and Conservation develop a watershed restoration strategy. Openlands, Illinois ($60,000) will, in partnership with the Healthy Schools Campaign, manage the Space to Grow program which transforms schoolyards into vibrant places that benefit students, communities, and the environment. The University of Toledo, Ohio ($59,988) will, in collaboration with North Toledo community members, Vistula Management, United North, and the Toledo-Lucas County Sustainability Commission, develop a plan to incorporate green stormwater infrastructure (GSI) at low income, multi-family housing sites in Toledo, Ohio. Lake Pontchartrain Basin Foundation, Lousiana ($60,000) will partner with several New Orleans-based underserved schools to assess neighborhood stormwater runoff. The data from which will be used to improve local pollution mitigation practices. Amigos Bravos, New Mexico ($55,508) will work with an underserved community located in Alburquerque’s South Valley to address chronic flooding due to poor stormwater management. Saint Louis University, Missouri ($58,793) will evaluate whether the use of brine pretreatment as an alternative to chloride used as road salt will help reduce local chloride water pollution. University of Nebraska-Lincoln, Nebraska ($59,935) will improve stormwater and green infrastructure training and assistance for Omaha’s workforce, students, and residents. City and County of Denver, Colorado ($60,000) will develop the Heron Pond Regional Open Space Master Plan to consolidate and restore into open space approximately 80 acres of land surrounding Heron Pond, with an ultimate goal of reducing urban runoff pollution, improving wildlife habitat, and creating recreation opportunities for the highly urbanized, industrial, and underserved Globeville neighborhood. 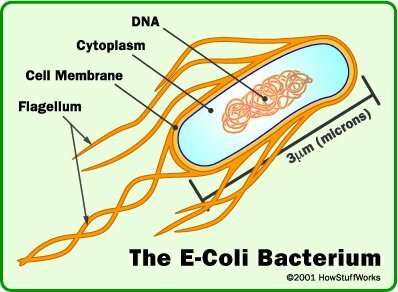 Groundwork Denver Inc., Colorado ($60,000) will work with local high school students from Sheridan, Colorado, an underserved community located at the mouth of Bear Creek, and Metropolitan State University, to determine the sources of E. coli feeding into the creek. South Dakota School of Mines & Technology, South Dakota ($58,996) will develop and promote a stormwater and green infrastructure educational program for K-12 and college students and the broader community, culminating in a community design charrette for the planning of low-impact development and green infrastructure practices for the proposed Rural America Initiatives development. Arizona State University, Arizona ($58,227) will work with students and Girl Scouts Troops to monitor water quality in local waterways and recreational fisheries to develop recommendations for community- based solutions. Constitutional Rights Foundation, California ($59,673) will, in partnership with Los Angeles Waterkeeper and UCLA, expand its teaching curriculum for local undeserved high school students on community stormwater assessments to include enhanced STEM education, and will conduct local civic-minded community environmental projects. Heal the Bay, California ($59,998) will partner with Los Angeles Trade Technical College and local high schools to monitor bacterial water pollution in the Los Angeles River, which will be used to make recommendations to local government agencies and watershed stakeholders for improving water quality and protecting public health. Lummi Indian Business Council, Washington ($56,433) will teach third- through fifth-grade students at the Lummi National Schools about how a watershed works, water quality parameters, sources of impairments, and how this impacts the salmon and shellfish that the Lummi Nation depends on for subsistence, economic, and cultural needs. The Lands Council, Washington ($45,250) will offer green job training and career pathways through the Green Sleeves Program at the Geiger Correctional Center in Spokane and will work with local high school teachers to develop and teach a year-long environmental science curriculum focusing on stormwater pollution and low-impact remediation. The Urban Waters Small Grants are competed and awarded every two years. Since its inception in 2012, the program has awarded approximately $6.6 million in Urban Waters Small Grants to 114 organizations across the country and Puerto Rico, with individual award amounts of up to $60,000. Fountain Creek: Can Bear Creek Dam in Jeff. County be a model for flood control? Following heavy rains which fell mid-Septembet 2013 in Colorado, the pool elevation at the Bear Creek reservoir rose several feet. At 4 a.m., Sept. 15, the reservoir pool elevation surpassed its previous record elevation of 5587.1 feet, and peaked at a pool elevation of 5607.9 ft on Sept. 22, shown here. Bear Creek Dam did what it was designed to do by catching the runoff and reducing flooding risks to the hundreds of homes located downstream. 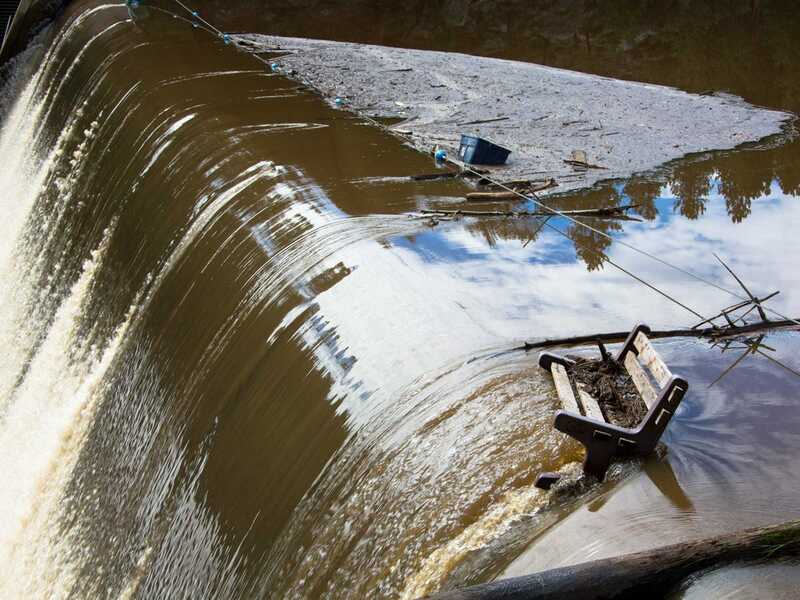 To see how a dam on Fountain Creek might function, it isn’t necessary to look far. For more than 30 years, three flood control dams have protected downtown Denver from flooding. The first was built on Cherry Creek in 1950, but when waters from the 1965 flood inundated Denver, two other dams, Chatfield and Bear Creek were also built by the U.S. Army Corps of Engineers. 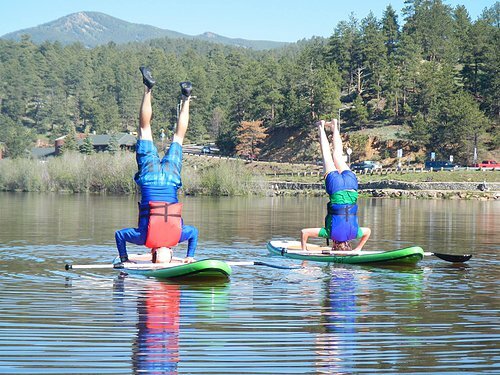 Of the three, Bear Creek Lake is the most similar to the type that would be built on Fountain Creek. The earthen dam, 1 mile long, was completed in 1982 and usually stores a relatively small amount of water, about 2,000 acre-feet. Most of the remaining area behind and around the dam is a city of Lakewood park, which offers camping, fishing, picnic areas, trails, archery ranges and golf courses. Other recreational lakes and wetlands are behind the dam. But twice in the past three years, the dam has prevented millions of dollars of damage by holding back water in a 236-square-mile drainage area — its primary function. In the September 2013 flood, the largest in Colorado’s recorded history, damage to numerous communities, highways and water structures was recorded. But Bear Creek, Chatfield and Cherry Creek kept it from being worse. Bear Creek Lake stored 28,500 acre-feet of the wall of water that descended during the 2013 event, well within its capacity. The lake level reached an elevation of 5,607 feet, higher than ever before and 50 feet above normal. Water releases began even as other areas still registered high water, because of the Corps’ protocols for operating all three reservoirs in tandem. It took three to four weeks to empty the floodwater. “The goal is to release the water as soon as possible, but you don’t want to release it too fast,” Maxwell said. Repairs to trails, roads and structures in the park cost $372,000 and were newly complete last May, when sustained rains pounded the Front Range. Like other areas, Bear Creek Canyon had weeks of sustained rain, which surprised the Corps by filling Bear Creek Reservoir again. The level of the lake rose 50 feet, and didn’t drop to normal until the end of July. Repairs the second time around in 2015 were less extensive, because there was more warning, a different type of flooding and lessons learned from 2013, said Drew Sprafke, Lakewood regional parks supervisor. The city of Lakewood didn’t have to foot the whole bill, but matched county, state and federal funds to make the repairs. But the inundation of water has changed the character of the park, Sprafke said. A dam, or multiple dams, on Fountain Creek would function in much the same way and has been talked about for years as a way to protect Pueblo from flooding. The first idea for a dam on Fountain Creek came as part of an Army Corps of Engineers study in 1970 following the flood of 1965. The dam was never funded, and levees on Fountain Creek were completed through the city of Pueblo instead. A multipurpose dam was brought up again by Pueblo County’s water attorney, Ray Petros, in 2005 as a potential alternative for Southern Delivery System. As sedimentation has diminished the effectiveness of the levees, the dam idea has been revived in recent years. A study last year by Wright Water Engineers for Pueblo County showed that 370,000 tons of sediment are deposited south of Colorado Springs each year as flows into Fountain Creek increase. Much of that winds up in Pueblo, raising the level of Fountain Creek and decreasing the effectiveness of the levees. A payment of $50 million toward flood control on Fountain Creek was written into Pueblo County’s 1041 permit for SDS, and a dam is central to studies. The Fountain Creek Watershed Flood Control and Greenway District, formed in 2009 as an outgrowth of the Vision Task Force, funded a U.S. Geological Survey study of hypothetical dam sites in 2013. That study showed the most effective way to reduce peak discharge and capture sediment would be a large dam about 10 miles upstream from the confluence of Fountain Creek at the Arkansas River. Another alternative would involve several detention ponds north of Pueblo, which would be nearly as effective in reducing peak flows, but would capture less sediment. A study for the district last year by engineer Duane Helton showed negligible impact on downstream water rights if flood control structures maintained a flow of 10,000 cubic feet per second through Pueblo during all but the largest flood events. The district is now preparing for more detailed feasibility studies that would show where structures could be located and how much they would cost. That’s a long way from the parks and trails that Lakewood residents enjoy near their flood control dam, but the Fountain Creek district is committed to protecting the creek and topping it with increased recreational opportunities only as the areas along the creek are stabilized. The district has spearheaded both flood control and recreation demonstration projects so far. Bear Creek Reservoir via City of Lakewood, June 15, 2013. 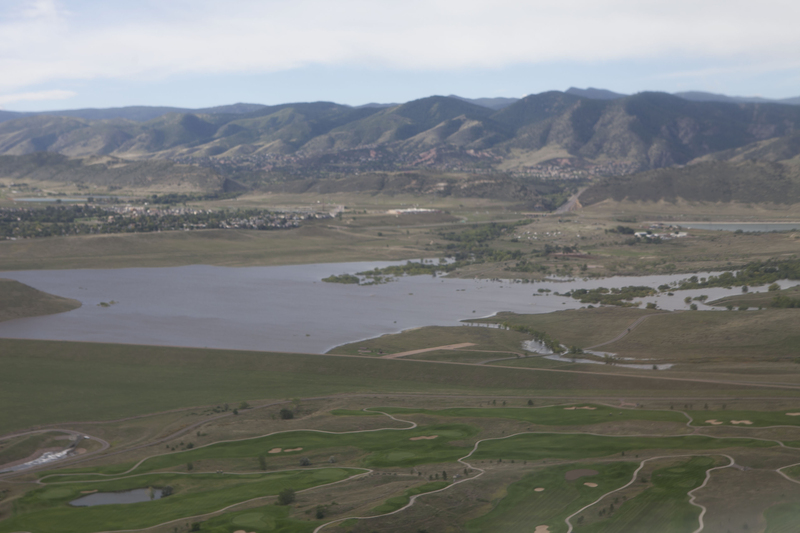 Bear Creek reservoir near Lakewood, Colorado, will be lowered twice from the current lake level of 5,558.7 feet to about 5,557.5 feet to allow for valve replacement work at Bear Creek Dam. The U.S. Army Corps of Engineers, Omaha District will begin the first lowering today and the second lowering will begin late next week. To lower the reservoir, releases will be increased to 70 cubic feet per second (cfs) which fall within channel capacity and are significantly less than the maximum 2015 summer release of 500 cfs. It will take less than one day for the reservoir to refill to the normal lake level of 5,558 feet. This work is being conducted in response to damage documented following recent flooding. Beginning Friday, March 11, normal operations will resume. Bear Creek Lake will be closed to all ice activities due to fluctuating lake levels. The valve replacement work has been coordinated by the U.S. Army Corps of Engineers with the State of Colorado and the City of Lakewood. Following heavy rains which fell mid-September  in Colorado, the pool elevation at the Bear Creek reservoir rose several feet. At 4 a.m., Sept. 15, the reservoir pool elevation surpassed its previous record elevation of 5587.1 feet, and peaked at a pool elevation of 5607.9 ft on Sept. 22, shown here. Bear Creek Dam did what it was designed to do by catching the runoff and reducing flooding risks to the hundreds of homes located downstream. 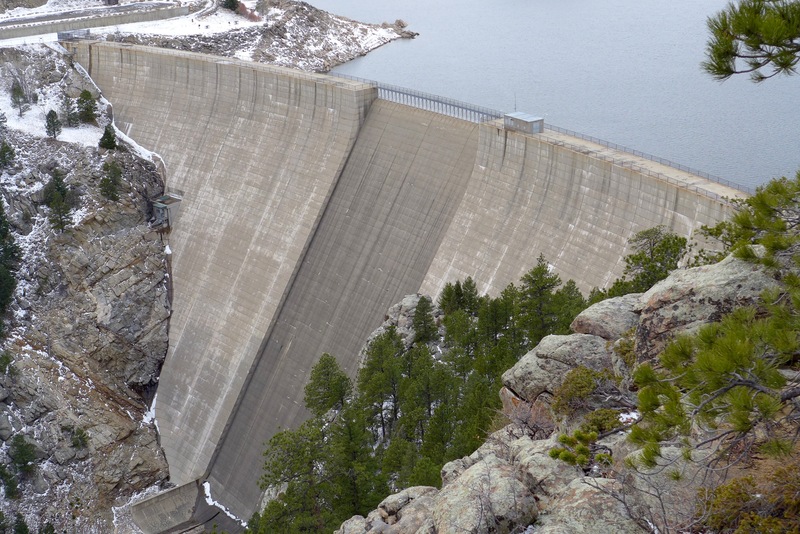 Bear Creek Reservoir near Lakewood, Colorado, will be lowered 5 feet from the normal operating pool elevation of 5,558 feet to allow for inspection and repair work at Bear Creek Dam. Starting Friday, October 23, releases will be around 50 cubic feet per second (cfs) which fall within channel capacity and are significantly less than the maximum summer release of 500 cfs. The drawdown is expected to take about a week. During the first three weeks of November, no release will be made from Bear Creek Dam to accommodate planned maintenance, survey, and inspection activities at the outlet works facilities of Bear Creek Dam. Valve repair work will also be conducted in response to damage documented following recent flooding. Beginning the last week of November, normal operations will resume and the lake will continue to refill. USACE has coordinated this inspection and repair work with the State of Colorado. Concrete barriers along the eroded creek bank in downtown Evergreen are still in place nearly two years after the 2013 flood that caused the damage. Evergreen businessman Jeff Bradley, manager of the property, said he has obtained a permit from Jefferson County for the project, and has plans to restore the bank. Bradley said he also needs a permit from the federal government, although the project does not involve funds from the Federal Emergency Management Agency. Another major bridge project is in the works at Evergreen Lake Park, which is owned by Denver Mountain Parks. The aging bridge that provides the only vehicle access to the park is scheduled for replacement next year. The Evergreen Park and Recreation District and the Evergreen Metropolitan District are each contributing $40,000 for the project, which is estimated to cost $790,000. The park district has added an additional $40,000 from Jeffco grant funding it received to assist with the bridge replacement cost. The 2013 flood contributed to the deterioration of the bridge at the Lake Park, EPRD board member Peter Lindquist noted.